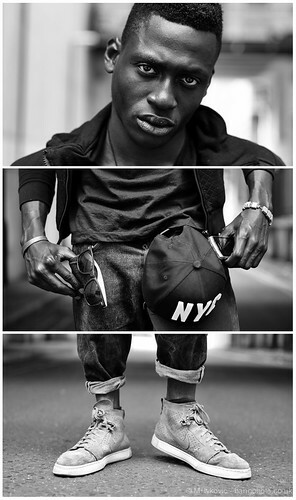 #48 Triptych Portrait Series – Seun @ Cliche, a photo by bang* on Flickr. Anyone looking back through the triptychs on here will notice missing numbers, worry not they’ve been shot just not everything makes it on here. The full series as it stands only resides upon my harddrive. One day I’ll be happy enough with it to publish the full thing, until then you’ll have to make do with the odd snippet now and then. Before Summer Ends, a photo by bang* on Flickr. Kate Waldron @ Boss Model Management. Sorry, I told you it’s been a busy month or so. Absolutely loads of new work shot so it’s about time I get to sharing some of it on here. Here are a few of the crop of images I shot with the brilliant Thembi Mkandla of Kate Waldron. Thembi hit me up with an idea of finding the least “English” looking beach we could whilst still not travelling too far from Manchester to shoot some summery beauty and swimwear stuff for both our portfolios. We found an awesome location or three thanks to the help of Alan, another photographer I know. He scouted us some great spots, hooked us up with space to base ourselves, humped my gear, drove people around, got sandwiches, and basically acted as a first rate second assistant whilst Michael (my usual assistant wrestled with the Rotalux in the wind). The beautiful designs we managed to acquire for the shoot came via Roscoe Forsythe a great Manchester stylist I’m happy to have made contact with, he pulled pieces from Joanne Miller & Laura Bancroft and they really took the whole ting to another level. A great team, great weather and slightly more production value than some of my recent “simple” shoots. Fell in love with the tiny Elinchrom pack (well my assistant did as he could lug the thing around all day on his shoulders and didn’t moan too much).